Github's Issues feature will serve as our “questions and answers” forum for this course. 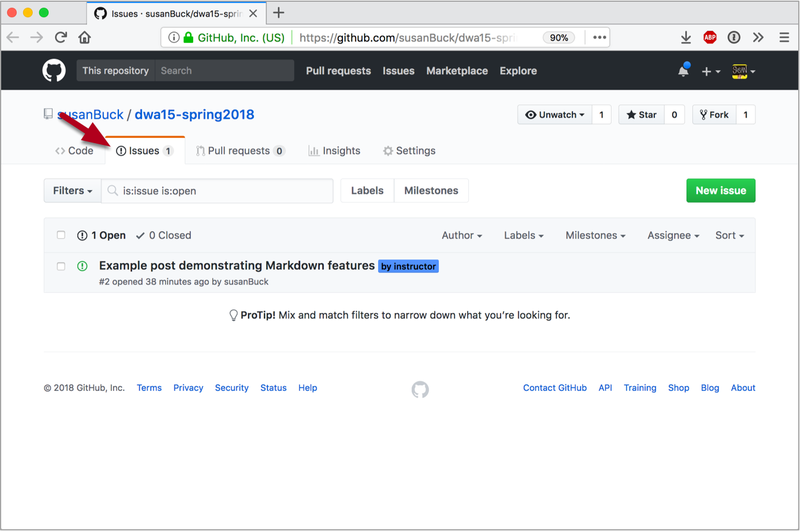 Traditionally, Github's Issues feature is used for documenting problems or feature requests in a specific software project. For example, you can see the Issues for Laravel (software we'll use this semester). The features built into Github's Issues, however, are also perfect for a questions and answer platform for a course such as this. So not only will we take advantage of those features, we'll also gain practice using a real world software development tool. Furthermore, by sharing information via Issues, we'll benefit from the collective knowledge of the class and practice technical communication skills. Questions regarding the Content Check portion of your weekly assignments; these must be completed independently without any conference with classmates. Questions about course structure/logistics, assignment clarifications, due dates, topic requests, grading, etc. When these kind of questions come through the forum, they're sometimes inaccurately responded to by students before I have a chance to answer them. Given this, I prefer these sorts of questions come directly to me. In a traditional in-person classroom - not only do you obtain information from the lecturer, but you absorb supplemental details when your classmates ask questions mid-lecture, or while engaging with your peers before/after lecture or during breaks. In an online course, much of this community chatter is lost, and with it so is the opportunity for learning via exposure to related questions and ideas. With this in mind, the Issues forum is not just about getting your questions answered - nor being able to answer other student's questions. Instead, it's about being actively engaged in a community to benefit from the supplemental learning opportunities available there. Skimming all new posts and reading follow-up threads on posts you find interesting. Using the response feature to "thumbs up" posts that you feel provide the most accurate or helpful answer. Sharing your own questions in a clear, thoughtful way (tips below on writing good questions). Sharing tips or suggestions that helped your own process. Sharing resources such as relevant guides or tools you found helpful. Do not feel discouraged if you can't answer questions, or even if you don't understand some of the questions being posted. Even if you don't understand something now, the point is to open yourself to new ideas from your classmates. Also, be aware that it's common to feel your own questions are too simple to post about. Every semester, I hear from some students who say reading their classmate's posts make them feel like the majority of the class is ahead of them in regards to skills, and this makes them hesitant to post. It's not that these students are in the minority, it's just that the advanced students are more confident about posting, and thus they post more creating the impression that everyone in the course is more advanced. With that in mind, assuming you've taken the time to carefully read the notes and do your due diligence to try to solve your problem, there are no stupid questions. By default, when you visit the Issues forum it shows you just the open posts. This view is helpful in regards to getting a sense of which students have unresolved problems, but you should also frequently skim closed posts for topics that were posted/resolved before you got to them. The primary purpose of Issues is to create a space where classmates can help each other out. However, completing your work is your own responsibility and if a solution is not reached for one of your posts, this is not an excuse for incomplete work. You can/should close your own posts as your issues are resolved. Search first for quicker resolutions: Posting in the Issues forum should not be your first stop in solving a problem. Instead, resources like Google, StackOverflow and the Laravel Forum are necessary resources that can often give you an immediate answer to the problem at hand. If you can't find your answer there, then search the Issues forum to see if anyone else is having a similar problem which has already been solved (or is in the process of being solved). If you can't find your solution, then post a new Issue. Write clear, thoughtful questions: One of the skills you'll be working on in this class is how to articulate technical problems; this is an essential skill for any programmer. The more information you can provide, the quicker your peers will be able to help you. The following is a quick summary of guidelines to help you build good posts. Take time to cleanly format your posts using proper Markdown syntax, code blocks, etc. ; the more organized a post is, the easier it will be for us to help you. (Markdown will be addressed in the first week of the semester). Bad: Code won't work! Help! Include your Github URL to the relevant repository and make sure your code is up to date. We can most effectively help you when we can replicate the problem on our own system. Describe what behavior you are expecting and how it is different from the behavior are you actually receiving. Include relevant errors and exceptions. Include any relevant environment details (live server, local server, Windows, Mac, etc. ).